Need to Reduce Emergency Department Overuse? Wait Times: Display the current ED wait time and the approximate total wait time post-triage. Want to be seen sooner? 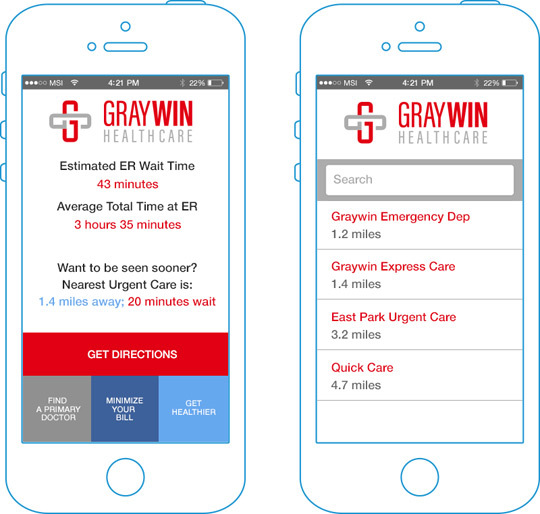 See the closest urgent care center; Tap to get GPS directions. Meet your Primary Care Provider: Include photo profiles of primary physicians in the network; Tap to request appointment. Minimize Your Bill: Engineer your patients’ behavior around the financial aspects of visiting the ED by providing transparent example-based explanations of ED costs vs. urgent care co-pay + insurance bill. We care about your time! Offer a simple questionnaire to help your patients predict whether they are likely to be admitted if they go to the ER with their symptoms. Display a map of urgent care centers within proximity; hours of operation; Tap for GPS directions. Show dynamically populated wait times for in-network urgent care centers. Search for urgent care centers by accepted insurance. Minimize Your Bill: Include a simple explanation of why it makes more sense financially to avoid going to the ER with minor issues. Provide examples of relative costs for common conditions: Urgent care co-pay vs. final bill, as opposed to the total ER bill. We are listening! We are keen to improve our service. Tell us about your experience! 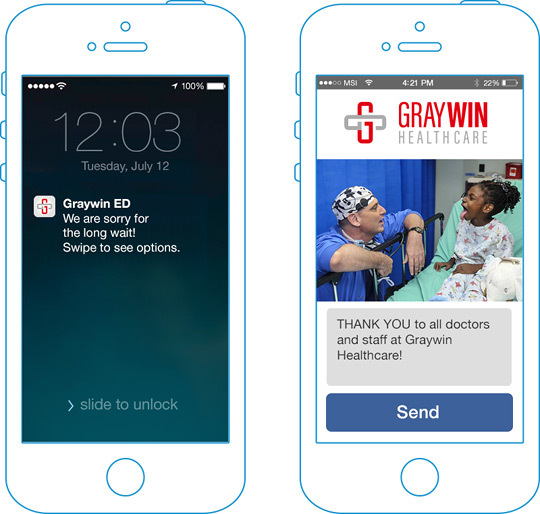 Patients can send feedback via the app; add images and comments. The in-app “vent board” is managed and responded to by your team. We invite you to start a mobile pilot at your Emergency Department. Work diligently with your ED stakeholders to identify the key problems and the patient behaviors that contribute to them. Identify the patients’ mobile moments we can leverage to modify these behaviors. 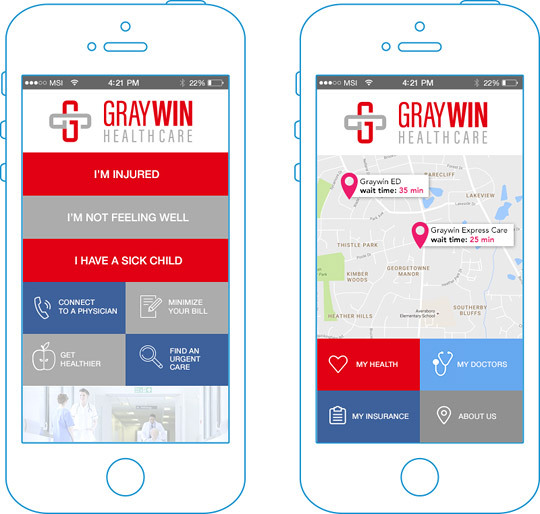 Design a polished mobile experience for your patients and an easy app management strategy for your staff. 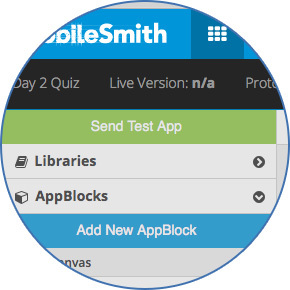 Together, use the MobileSmith Platform to build out your app iteratively and launch it to a focus group or to general audience. Train your team to take over further design and development. Benchmark and measure key performance indicators. Creating your app in the MobileSmith platform enables us to apply the agile methodology and ensure that your final app fully meets your expectations. Start small; prototype the first version rapidly; launch the initial version of your app in weeks. Test on real devices; iterate often; polish the workflow and user experience. Track app analytics and update the UI on the fly; ensure the success of your app. 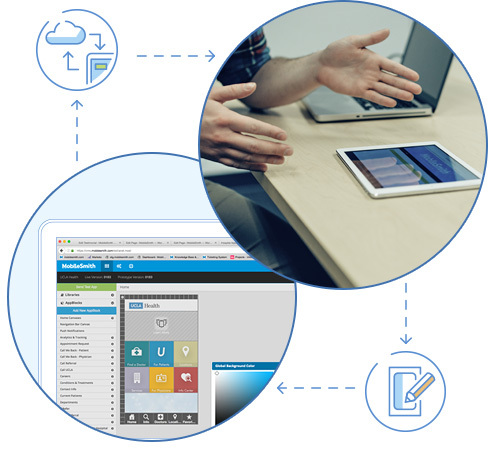 Manage your app and update content in real time – no need to resubmit/ re-download the app. 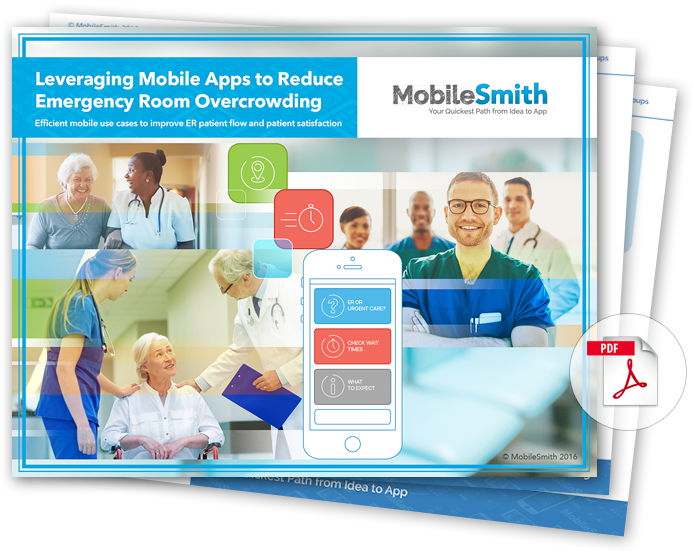 Download our latest Whitepaper, Leveraging Mobile Apps to Reduce Emergency Room Overcrowding to explore how apps can help your patients and reduce costs today!